One of the most refreshing comments made by newly appointed Senator Tim Storer was that he would judge each piece of legislation on its merits and would not be horse-trading. That, of course, would require him taking the time to read the legislation and having the capacity to understand it, unlike Pauline Hanson who can be fooled into supporting anything if you throw her a bone. In order to gain Pauline’s support for weakening media ownership laws, Turnbull agreed to have a review into the competitive neutrality of the ABC and SBS – yes, another one. Now one would think that the appropriate body to advise on that would be the Productivity Commission’s Australian Government Competitive Neutrality Complaints Office which handles complaints and provides advice to the government on unfair competition from the public sector after a complaint is made by the private sector. He will be joined by Sandra Levy who worked at the ABC and Channel 9 and then at the Australian Film, Television and Radio School, and Julie Flynn who spent 15 years as the boss of Free TV Australia, the lobby group for commercial free-to-air broadcasters. They will report to the government by July on whether ABC and SBS are “operating in a manner consistent with the general principles of competitive neutrality”. “The Commonwealth Competitive Neutrality Policy requires that government business activities should not enjoy net competitive advantages simply by virtue of their public-sector ownership,” the terms of reference note. The cost of this review doesn’t rate a mention in any reporting I have seen so far. One might have thought that Pauline would be interested in why Mitch Fifield, off his own bat and with no due process or direction, gifted $30 million in sports broadcasting funding to News Corporation’s Fox Sports which is only available to subscription viewers. But no. Pauline is much more interested in finding out how much ABC staff are paid, another demand that the government agreed to. One of the main gripes about the national broadcaster is about it’s online news which groups like Fairfax complain is unfair – we shouldn’t get our news for free apparently even though Fairfax often write about stories broken by the ABC themselves. We have already seen the results of that pressure with many current affairs and news programs axed and a deliberate move to show more stories on “hip pocket” and “human interest” issues, which is presumably why Leigh Sales cuts short interviews with the nation’s leaders so we can see her latest simpering chat with some celebrity. The government needs Pauline’s vote in the Senate and Pauline is on a mission to destroy the ABC and will happily give the government what it wants as long as she gets her revenge on those lefty bastards that tricked her into looking stupid. Kaye I wouldn’t get too excited if I were you, the test will be if he can withstand the pressure that the coalition will put him under as time goes by. I know it’s obvious, but I can’t resist. 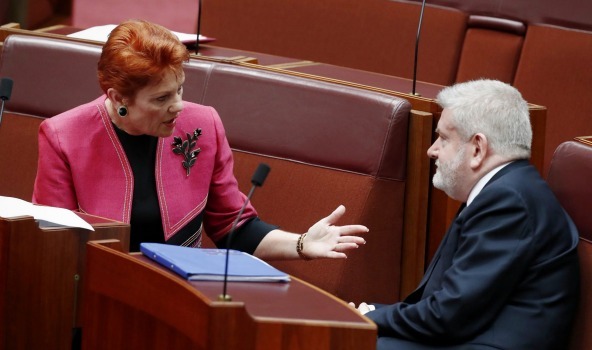 Pauline doesn’t need anybody’s help to look stupid; she does a great job of that by herself. Which is why Pauline and her sidekicks will never appear on the ABC. The audience is a tad more savvy than Andrew Bolt’s. Pauline and Andrew are great for a laugh though, you have to give them that. Just another example of the lengths this wastrel govt will go to, to stay in power. With a bit of luck it will be drawn out until the next election. And with a smudge more luck, at least one or two of Paulines seat warmer crew will lose their seat, because it will be harder to get in this time. Hanson demonstrates the complete insanity of the parliamentary citizenship saga. Honest people like Ludlum and Lambie were driven out on a technicality bordering on absurdity while real criminals remain to thrive and prosper. In a world where true fairness prevailed, Pauline Hanson’s stupidity would guarantee her removal the next time she figures in an election, sadly the world isn’t fair. Unfortunately we are stuck with Pauline for 6 years but if her buddies are voted out then she has no power. I think she will find it very lonely then. We will probably get rid of Leyonjhelm too at the next election. Hanson, is a bloody idiot. She just wants a free ride and no analysis of the insanity of her party and its policies. Vendetta politics. Hanson’s vendetta is against the educated. They upset her immensely. Yes, Pauline, the ABC “tricked” you by reporting the truth, I understand you are more of a “Fake News” type of gal and reality sure does bite. Not to mention sacking the long term One Nation Treasurer (who was the one who wooed her to come back) and installing her brother-in-law instead. She has employed as advisers James Ashby and Malcolm Roberts. What does that tell you about the woman’s judgement and the ‘quality’ of the advice she is getting. It’s more horse feathers than horse trading when Hanson is involved. I love the reference to SIMPERING CHATS with sundry celebrities, a pet squirm of mine regarding the deteriorating quality of Ms Sales’ program. I’m afraid ms Sales gets no air time in our abode these days. As with MT, Duttin, Scomo…..well, any of LNP dross really, the sound goes off, and we make up a conversation as we imagine it is going…..except MT….we can’t stand the sight of the simpering slimy snake!